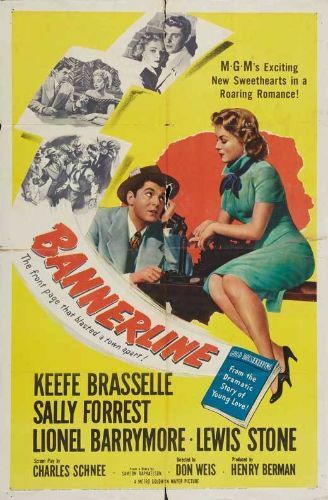 Bannerline was Don Weis' first solo directorial credit for MGM. Keefe Brasselle stars as cub reporter Mike Perrivale, who devises a heart-tugging promotional stunt. Upon learning that crusty old history teacher Hugo Trimble (Lionel Barrymore) is dying, Mike writes up a glowing tribute, ascribing all sorts of fabricated accomplishments to the venerable Trimble. The stunt backfires when crime boss Frankie Scarbino (J. Carroll Naish), angered that some of the civic reforms credited to Trimble may put the kibosh on his own operation, threatens to make trouble for Mike. As it turns out, it is the impulsiveness of Scarbino's hired thugs which sets the wheels of reform in motion--simply by beating Mike to a pulp.